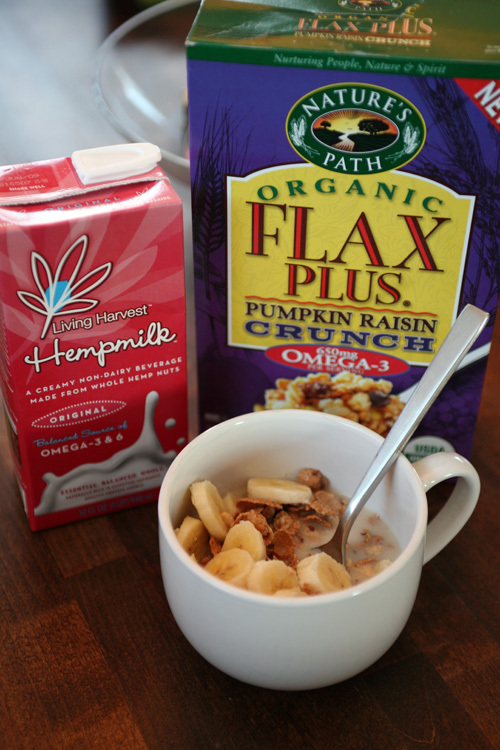 Breakfast: 3/4 cup Flax Plus Pumpkin Raisin Crunch cereal from Nature's Path with 3/4 cup Hemp Milk and 1/2 a banana sliced. 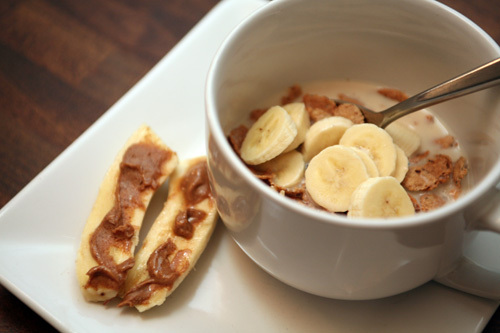 On the side, the other 1/2 banana with 1 tbsp almond butter. I'm ready to use up this cereal. Its good, but it has more calories per serving than I typically look for in a cereal and doesn't keep me full for very long. I'm getting close... The hemp milk is really good. It is thinner than soymilk, and has a slightly sweeter flavor. I still think that I prefer soymilk but the hemp is nice to keep around because it doesn't have to be refrigerated before opening. Its my back-up milk. 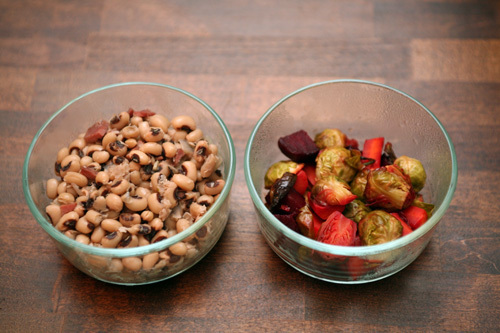 Lunch: Leftover black-eyed peas on brown rice and the last of the roasted veggies. 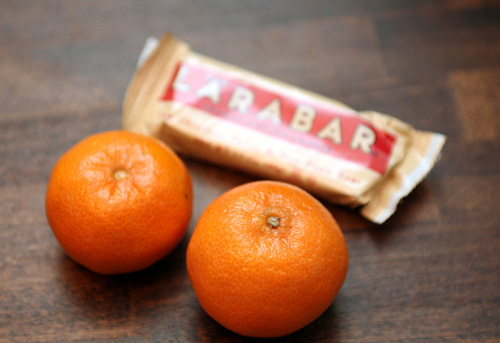 Snacks: I spread 2 clementines and a peanut butter cookie Larabar throughout the day. I also had 3 brazil nuts and 2 mugs of Sugar Cookie Sleigh Ride tea (to try and thaw myself out). Oh. My. Goodness. 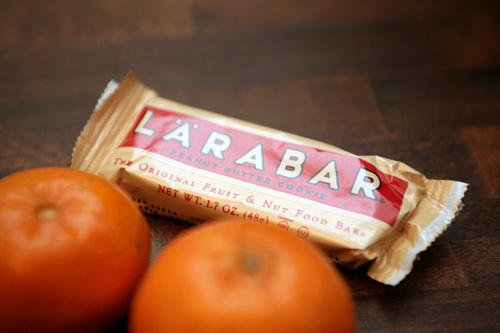 Now I know why you all have been raving about the PB Cookie Larabars!!! I couldn't find this particular flavor for the longest time, but while searching for some gifts the week before Christmas I happened to run into a store I don't visit often and found this beauty on their shelf. It was amazing!!! The only ingredients? Dates and peanuts. I'm in love. I had every intention of eating just 1/2 the bar but couldn't stop once I started. These could be really dangerous...luckily they are good for me! 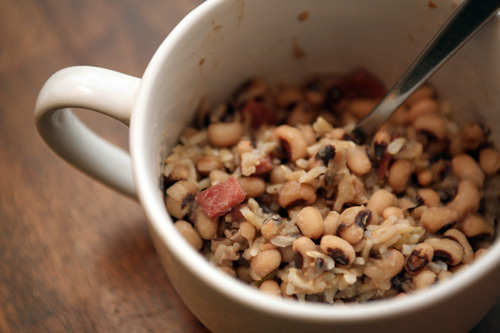 Dinner: Another bowl of black-eyed peas on brown rice. Shockingly I haven't tired of these yet! Don't be surprised if you see a repeat tomorrow, but after that I'm freezing the remainder. They'll make a great lunch in a couple of weeks. 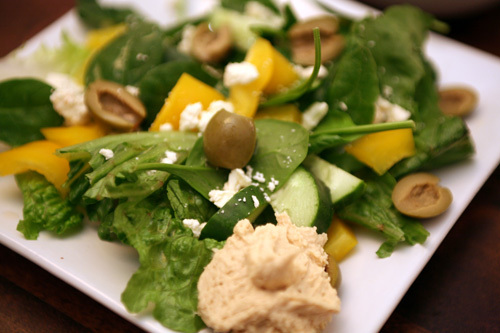 I also made a big salad with romaine, spinach, cucumber, yellow bell pepp, green olives and feta cheese. I added a glob of roasted garlic hummus on the side because it sounded tasty, and drizzled the salad with 1/2 tsp grapeseed oil and 1 tsp moscatel wine vinegar. Dessert: Our dear friend Kelly, whose husband Steve was the guest of honor at the New Years Eve Surprise Birthday Party we unfortunately had to miss, brought us a plate of leftover birthday cake today! 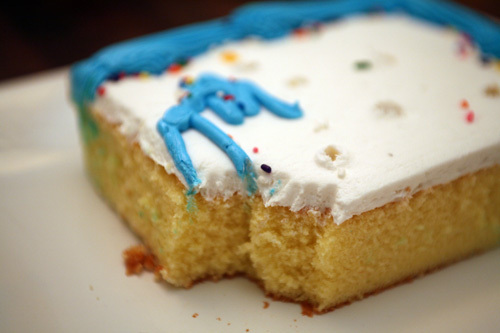 My biggest weakness in the whole culinary world is cake. I LOVE CAKE. Who doesn't? Cake tops cookies, pies, brownies and ice cream on my list of favorite sweets. Exercise: Before dinner tonight I pulled out my favorite yoga DVD for 30 minutes of intense stretching. I wouldn't call it a power yoga session because I wasn't sweating, but I was definitely working my whole body and feel so much better now for it. It had been two weeks since my last yoga practice and I was really feeling the need to get back into it. Afterwards I did 10 minutes of ab work in various positions. Tomorrow is a long run day and I feel stretched and ready to go. I'm nervous because my longest run in the last 3 weeks was 2-1/2 miles while in Florida. Eek! I didn't realize it had been that long since our 3-1/4 mile run. Now I'm really nervous. We were supposed to run a 5k on New Years Day but weren't up for it after all the traveling and dog sickness etc. I think I'm going to plan on a 4 mile run tomorrow, a 4-1/2 mile run mid-week, along with a couple more shorter runs and then hopefully be back on track for the 5 mile run scheduled for next weekend. Scary! Alrighty, I have a date with my hubb and a movie. Anybody have any exciting plans for this weekend or are you all just recovering from the holidays like we are?